If we are lucky to be able to look up on a clear summer night at a place with little light pollution, we would see Milky Way with its faint stripe of stars. If we are a little bit luckier that we can see infrared light with our naked eyes, we would see Milky Way in its hidden and more beautiful form. In infrared, our mother galaxy would reveal itself as a long and broader stripe full of gas and dust, with sometimes complicated structures like twisted filaments. Likely your eyes would be caught by the many spherical shapes with reddish hues surrounded by a round blue circle (here the “red” and “blue” are the two new colors received by your far/near-infrared color receptive cones). These are what astronomers (loosely) call “bubbles” or “shells,” which are indeed almost everywhere across our Milky Way. 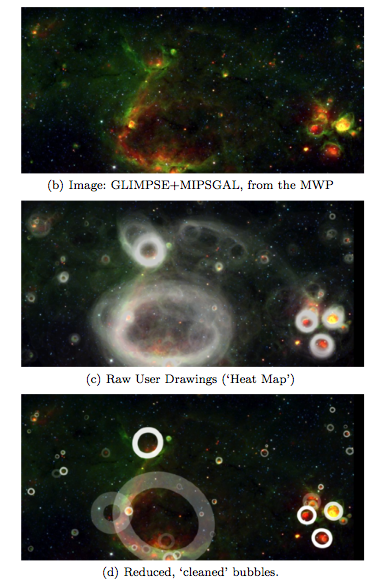 If you ever participate in the citizen science project, the “Milky Way Project,” you are probably familiar with these bubbles on the infrared maps that pop up on your screen. Citizen science projects took off with the fast development of internet speed and home computers in 2000s and have since evolved from the rotating numbers and curves in SETI@home to the pretty maps which you can actually work on in Galaxy Zoo. The Milky Way Project is part of the Zooniverse program which first started its crowd sourcing project with Galaxy Zoo in 2007. It now includes two sub-projects: BUBBLES and CLOUDS, where different maps are used to identify, unsurprisingly, bubbles and the so-called infrared dark clouds. In both projects, images taken by NASA Spitzer Space Telescope are used as the maps where citizen scientists look for these structures just as they do when identifying, say, a park on Google Maps. BUBBLES, serving as the trailblazer for the Milky Way Project, ask participants to describe the shape and the size of a bubble on Spitzer maps covering the inner part of our galaxy. On the interface, citizen scientists are able to draw a circle on what they think is a bubble and to subsequently change the thickness of the circle, the shape (or, the ellipticity) of the circle and, when needed, to report an incompleteness in the circle, to match the geometry of the bubble. Like most other citizen science projects, BUBBLES propel the participants by giving scores and letting them compete with each other on the quality and the number of bubbles they identify. Like non-citizen science, citizen scientists are encouraged to review their results and discuss with their fellow scientists. If you want to have a taste of being an astronomer (or you ARE an astronomer), BUBBLES also provide advanced tools for citizen scientists to search in astronomy catalogues such as SIMBAD to look for previously known astronomical objects on the maps. 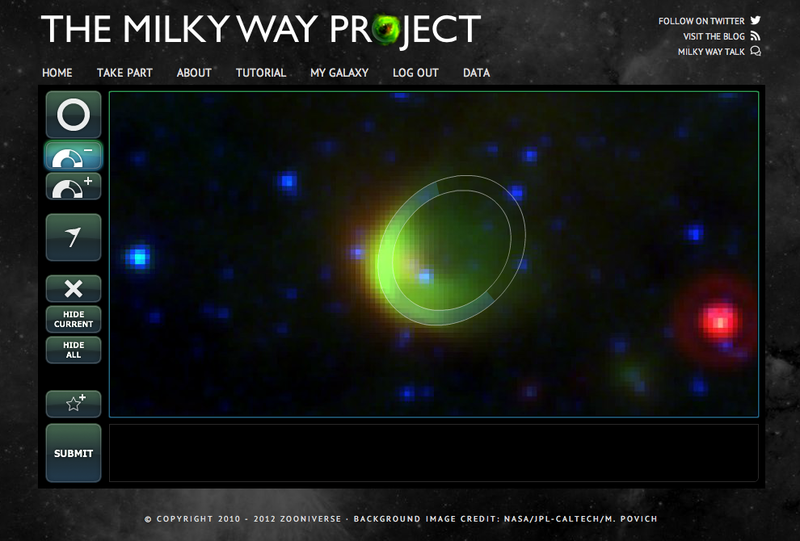 A screen shot of the Milky Way Project: BUBBLES interface. On the left are tools to adjust the shape of the circle. In the Milky Way Project, both Spitzer and Herschel data are being shown to the citizen scientists. In order to achieve the best result from crowd sourcing, different combinations of wavelengths are used respectively in BUBBLES and CLOUDS. While CLOUDS set their goal on identifying infrared dark clouds and use longer-wavelength maps from Herschel, BUBBLES use 4.5/8.0/24-µm images from Spitzer on blue/green/red color maps. Data in BUBBLES are taken from the Galactic Legacy Infrared Mid-Plane Survey Extraordinaire (GLIMPSE) and the Multiband Imaging Photometer for Spizter Galactic Plane Survey (MIPSGAL), from Spitzer Space Telescope, with a coverage of ±65˚ in galactic longitudes and ±1˚ in galactic latitudes. The first result of the Milky Way Project was released in 2012, with a catalogue of 5,106 bubbles after combing through a total of 520,120 circles drawn by participants. The combination process pushes the user-drawn circles through two sets of 2˚ by 2˚ grids, with one offset by 1˚ from the other. An automatic clustering algorithm would start to group user-drawn circles if there are more than five circles in a 2˚ by 2˚ box, and a “hit rate” is calculated from the number of user-drawn circles over the number of times the map is shown to participants. The offset grids prevent circles on the border of the first set of grids from being left out. The whole process automatically leaves out “lonely circles” which are less likely to be real bubbles. The reason why we study these bubbles is that they are often related to star formation, of which we still do not have a full picture although a simple scheme can be derived from a few decades of observations. We know that the star formation tends to happen in clusters and that it is affected by forces and radiation from stars. As massive stars live shorter lives, those we see on the sky are young and thus close to where they are born. The stellar winds from these massive stars thus cast strong impacts on the star forming sites and can either trigger or disturb the next generation of star formation (or more often, trigger and disturb at the same time). This makes bubbles interesting places that astronomers want to study, and identifying them would be the first step. The massive stars that push the expansion of bubbles do not only drive momentum-loaded materials but strong radiation as well. All O-type stars and the most massive B-type stars emit photons strong enough to ionize the hydrogen atoms, dissociated by cosmic rays and photons from nearby stars at the surface of denser and thus heavily self-shielded molecular regions. Due to the complicated geometry of stellar clusters, shapes of HII regions are often irregular and can sometimes be filamentary. Bubbles in the Milky Way Projects are not necessarily related to HII regions, and less massive stars and young stellar objects (YSOs) can create bubble-like cavities as well. When stellar winds from massive stars blow outward in the dust and gas medium, they often move in supersonic speed and thus create discontinuities of physical properties (temperatures, densities, pressures, etc.) at the front of expanding bubbles. These discontinuities are called shocks and provide a genuine environment for characteristic emissions and chemical reactions. Masers and molecular line transitions of certain species like SiO are observed in this environment. People use these emissions to trace strong interaction between stars/YSOs and the interstellar medium to find out what effects this feedback process can have on the subsequent star formation. This module allows you to play around bubbles identified in the Milky Way Project in World Wide Telescope. By fading between different all-sky maps, you will be able to explore the correlation of emissions at different wavelengths and the bubbles. The complete GLIMPSE+MIPSGAL survey map is readily imported in World Wide Telescope in the same set of color combination as that in the Milky Way Project, so you can get a sense of how people identify bubbles on the exact map shown to them. Other infrared surveys taken by various instruments such as Wide-Field Infrared Survey Explorer (WISE) and Infrared Astronomical Satellite (IRAS) that can be interesting to overlay on are also available in World Wide Telescope. You can also play with the dust map and the H-Alpha emission map, which are also closely related to star formation. In this module, catalogues taken from HII Region Discovery Survey (HRDS) is used to show positions of galactic HII regions. 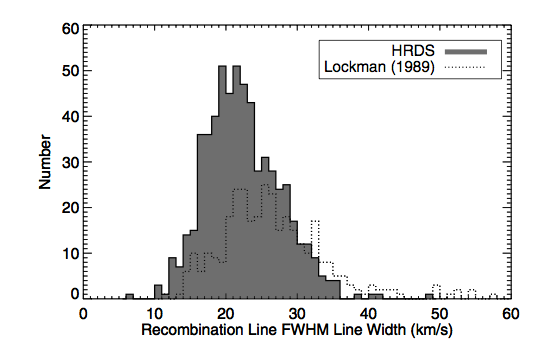 Although the HRDS catalogue does not intend to be complete, covering only a sub-region of -17˚ to 67˚ in galactic longitudes within ±1˚ in galactic latitudes, it does give a sense of where typical HII regions are distributed. By exploring this catalogue in the module together with the data from Milky Way Project, you can see how these two types of objects are (not) correlated with each other. Screen shot of the interactive map shown on the HRDS website. When this WWT module is finished, the WWT html5 implementation could provide a better visualization of the HRDS data. Here are the WWT tour and the excel files that are shown in the tour. To view the tour, simply download the file in the link below. You can open the tour file in both web client and Windows client by going to the pull-down menu under “Explore,” finding “Open…” and then clicking on “Tours.” You are also welcome to download the data tables and explore them on your own in WWT. To view these data tables in WWT, first you have to install Windows client of the latest WWT version on your machine, and go here for WWT Excel Add-in. When you finish the installation, you will see a WWT tab in Excel when you open these tables. Select the columns you want to import into WWT and click on “Visualize Selection” button. After setting the correct labels for each column, you can click on “View in WWT” and start your exploration! 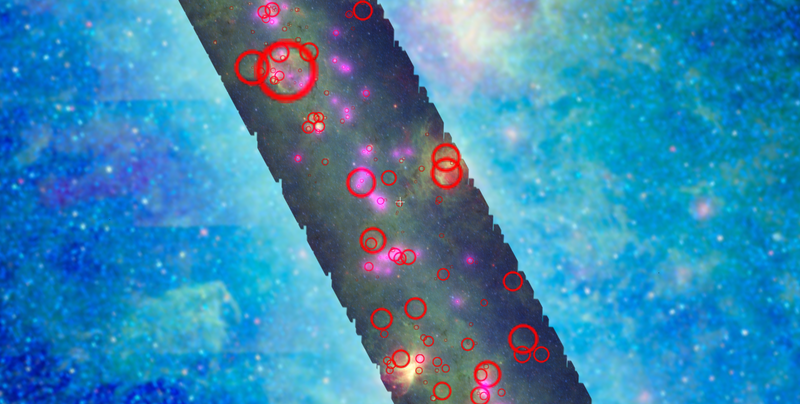 WWT saved view of imported data: red circles indicate bubbles identified in the Milky Way Project, and purple dots indicate positions of HII region observed in HRDS. The HII Region Discovery Survey released the result in a series of five papers. The targets were selected based mainly on previous results from 21-cm HI emission and continuum observation at Very Large Array (VLA), including a piloting effort on radio survey of the galactic plane: the Multi-Array Galactic Plane Imaging Survey (MAGPIS). The 24-µm image from Spitzer MIPSGAL is used as a reference in selecting targets as well. Seven radio recombination lines (RRLs, from H87α to H93α) with frequencies falling in the GBT X-band receiver are observed toward each target. The velocity resolution of such observations can reach ~ 0.4 km/s per channel and thus allows us to derive kinematic distances for these objects. Pick your favorite project from the zoo of citizen science projects and take part! Zooniverse would be a good place to start, with projects in fields ranging from astronomy to meteorology to biology. One advantage of Zooniverse projects over other citizen science projects (besides the pretty pictures) is their well-documented background explanation. By reading through the project introduction, you can pick up what is really intriguing to scientists and understand why people want to study these objects. As the Galaxy Zoo co-founder Kevin Schawinski said, “we prefer to call this [Galaxy Zoo] citizen science because it’s a better description of what you’re doing; you’re a regular citizen but you’re doing science. …You’re pro-actively involved in the process of science by participating.” If you are interested in science but was daunted by equations, give these projects a try. Science is actually a few clicks away! Data sharing is the future of science, and luckily for those who are interested in bubbles, the data presented in this module are all publicly available. 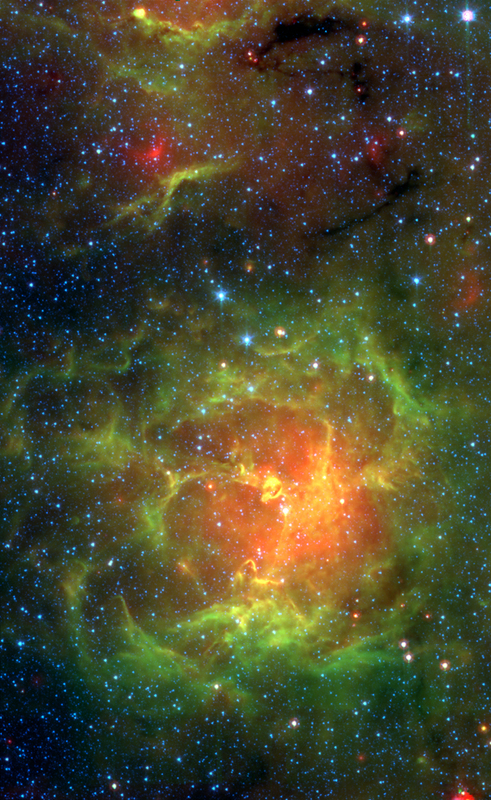 The Milky Way Project released its first result of BUBBLES in 2012, which includes one catalogue of “large bubbles” and one of “small bubbles.” The “large” and “small” here indicate whether or not the bubbles/”knots” are large enough to be simulated by at least the smallest possible circular shapes available on the identification interface. In the catalogues, columns of galactic coordinates and geometric parameters are included together with “hit rate” and “dispersion” to indicate the reliabilities of identified bubbles. The HII Region Discovery Survey data are available via the project website. The Arecibo and GBT parts of the survey are separated in two independent files. Correlation can be found using the source id in the catalogues. Here in this module only the GBT part is presented as the derived kinematic distances are available in the GBT catalogue but not the Arecibo one, due to the fact that Arecibo did not bear the capability to resolve the confusion of overlapped velocity components toward inner Milky Way with the settings of this survey. Besides coordinates, velocities and velocity-based distances are available in the catalogues, and those who are interested can refer to their papers for details about the line surveys. When discussing young stellar objects and protoplanetary disks, astronomers continually throw out the term ‘SED.’ For the past week, I have been at a conference titled ‘Transformational Science with ALMA: From Dust to Rocks to Planets– Formation and Evolution of Planetary Systems.’ And, I can attest to the fact that the term ‘SED’ has come up in a very significant fraction of the contributed talks. For those not intimately familiar with this sub-field, this rampant use of abbreviations can be confusing, making it difficult to glean any useful take-aways from a talk. So, in addition to summarizing the article by Robitaille et al. (2007), the goal of this post is to give a bit of an introduction to the terminology and motivation for the growing field of star and planetary system formation. The abbreviation ‘SED’ stands for ‘Spectral Energy Distribution.’ If you want to sound like an expert, this should be pronounced exactly as it appears (analogous to the non-acronym ‘said’). A SED is essentially a graph of how the flux of emission from an object depends on the wavelength the object is observed at– flux plotted versus wavelength. In the context of the Robitaille et al. article, we are most interested in the SEDs for young stars and the envelopes and disks surrounding them. So, why exactly does the flux from a young stellar object (YSO) vary with wavelength? As it turns out, different regions of the YSO emit at different wavelengths. This means that when we observe at different wavelengths, we are actually probing distinct regions of the star, envelope, disk, etc. By tracing out the entire SED for a YSO, we can actually determine what the geometry, structure, and constituents are for that object. SEDs for pre-main sequence stars are often seen to have a bump or excess in the infrared. This bump is generally interpreted as being due to thermal emission from warm dust and gas surrounding the central star. 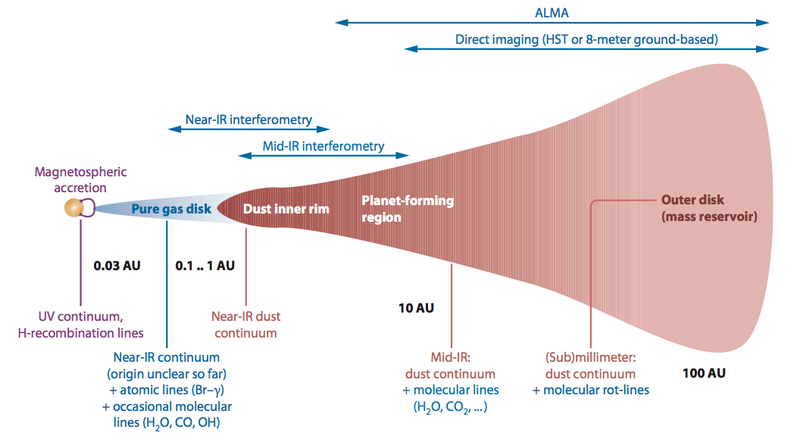 As an illustrative example, let’s consider a protoplanetary disk around a young star. The image below is taken from a review article by Dullemond & Monnier (2010) and shows a graphical representation of the emission spectrum from such a disk. In this case, emission in the Near-IR traces the warmer inner regions of the disk. As you move into submillimeter wavelengths, you start to probe the outer, cooler regions of the disk. By modeling the observed SED of a pre-main sequence star, you can determine what components of the source are contributing to the observed flux. The second figure below is taken from a paper by Guarcello et al. (2010). The left panel of this figure shows the observed SED of a BWE star (in line with other ridiculous astronomy acronyms, this stands from ‘blue stars with excesses’), while the right panel shows a model fit to this data. The authors describe the observed SED using a model with four distinct components: (1) emission from the reddened photosphere of the central star, (2) radiation scattered into the line of sight from dust grains in the disk, (3) emission from a collapsing outer envelope, and (4) thermal emission from a circumstellar disk. The summation of these four component makes up the complete SED for this BWE. As a protostar evolves towards the Zero Age Main Sequence (ZAMS), the system geometry and, as a result, the SED will evolve as well. Thus, the stage of evolution of such a protostar is often classified according to features seen in the SED. 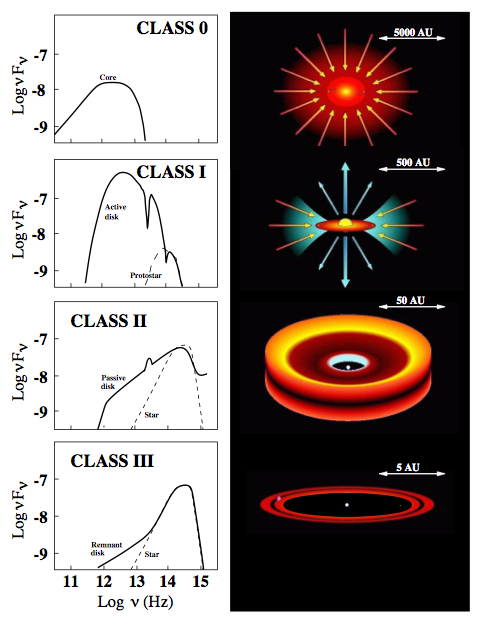 A graphical overview of the four stages of protostar evolution are shown below (Andrea Isella’s thesis, 2006). Class 0 objects are characterized by a very embedded central core in a much larger accreting envelope. The mass of the central core grows in Class I objects and a flattened circumstellar accretion disk develops. For Class II objects, the majority of circumstellar material is now found in a disk of gas and dust. Finally, for Class III objects, the emission from the disk becomes negligible and the SED resembles a pure stellar photosphere. One common method of fitting SEDs is to assume a given gas and circumstellar dust geometry and set of dust parameters and then use radiative transfer models to find a set of parameters that best reproduce the observations. However, fitting SEDs by trial and error is a time consuming way to explore a large parameter space. The problem is even worse if you want to consider thousands of sources. So, what’s to be done? Enter Robitaille et al. In order to attempt to make SED fitting more efficient, they have pre-calculated a large number of radiative transfer models that cover a reasonable amount of parameter space. Then, for any given source, they can quickly find all of the combinations of parameters that could explain the observations. However, there are truly a vast number of parameters that could be varied in models of YSOs. Thus, for simplicity, the authors are forced to make a number of assumptions. What are some of the biggest assumptions involved? All stars form via accretion through a disk and an envelope. The gas-to-dust ratio in the disk is 100. The apparent size of the source is not larger than the given aperture. The last constraint is not required, but it allows a number of model SEDs to be cut out and thus speeds up the process. Furthermore, the authors make a point of saying that the results can always be scaled to account for varying gas-to-dust ratios, since only the dust is taken into account in the actual radiative transfer calculations. All sources are within a distance range of 120 – 160 AU. The foreground interstellar extinction is no more that 20. The upshot of this study is that for the vast majority of the sources considered, the best-fit values obtained by this new SED fitting tool are close to the previously known values. Check. It is also worth mentioning here, that there are many other sets of SED modeling codes. One set of codes of particular note are those written by Paola D’Alessio (D’Alessio et al., 1998; D’Alessio et al., 1999; D’Alessio et al, 2001). These codes were the most frequently used in the results presented at the ALMA conference I attended. The distinct change in the D’Alessio models is that they solve for the detailed hydrostatic vertical disk structure in order to account for observations of ‘flared’ disks around T Tauri stars (flaring refers to an increase in disk thickness at larger radii). But, Wait! There are Caveats! Although the overall conclusion is that this method fits SEDs with reasonable accuracy, there are a number of caveats that are raised. First of all, the models tend to overestimate the mid-IR fluxes for DM Tau and GM Aur (two sources known to have inner regions cleared of dust). The authors explain that this is most likely due to the fact that their models for central holes assume that there is no dust remaining in the hole. In reality, there is most likely a small amount of dust that remains. Second, the models do not currently account for the possibility of young binary systems and circumbinary disks (relevant for CoKu Tau 1). The paper also addresses estimating parameters such as stellar temperature, disk mass, and accretion rate from SED fits. And, yes, you guessed it, these calculations raise several more issues. For very young objects, it is difficult to disentangle the envelope and disk, making it very challenging to estimate a total disk mass. To make these complications clearer, the set of two plots below from the paper show calculated values for the disk mass plotted against the accepted values from the literature. It is easily seen that the disk masses for the embedded sources are the most dissimilar from the literature values. Furthermore, even if the disk can be isolated, the dust mass in the disk is affected by the choice of dust opacity. That’s a pretty big caveat! A whole debate was started at the ALMA conference over exactly this issue and the authors have swept it under the rug in just one sentence. In addition, the calculated accretion rates from SED fitting are systematically larger than what is presented in the literature. The authors conclude that future models should include disk emission inside the dust destruction radius, the radius inside which it is too hot for dust to survive. A great example of the complications that arise from a disk with a central hole can be seen in LkCa 15 (Espaillat et al., 2010; Andrews et al., 2011). The figure below shows the observed and simulated SEDs for the source (left) as well as the millimeter image (right). The double ansae seen in the millimeter contours are indicative of a disk with a central cavity. 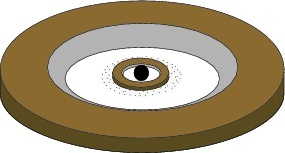 In this case, a population of sub-micron sized dust within the hole is needed in order to produce the observed silicate feature at 10 microns. Furthermore, an inner ring is required to produce the strong near-IR excess shortward of 10 microns. A cartoon image of the predicted disk geometry is shown below. To make things even more complicated, the flux at shorter wavelengths appears to vary inversely with the flux at longer wavelengths over time (Espaillat et al., 2010). This phenomenon is explained by changing the height of the inner disk wall over time. Finally, the authors discuss how well parameters are constrained given different combinations of data points for two example sources: AA Tau and IRAS 04361+2547. In both sources, if only IRAC (Infrared Array Camera on the Spitzer Space Telescope) fluxes are used, the stellar mass, stellar temperature, disk mass, disk accretion rate, and envelope accretion rate are all poorly constrained. Things are particularly bad for AA Tau in this scenario, where only using IRAC data results in ~5% of all SED models meeting the imposed goodness of fit criterion (yikes!). Adding in optical data to the mix helps to rule out models that have low central source temperatures and disk accretion rates. Adding data at wavelengths longer than ~ 20 microns helps to constrain the evolutionary stage of the YSO, because that is where any infrared excess is most apparent. And, adding submillimeter data helps to pin down the disk mass, since the emission at these longer wavelengths is dominated by the dust. This just goes to show how necessary it is to obtain multi-wavelength data is we really want to understand YSOs, disks, and the like.